I've looked at all of the videos and determined where to file. No problem fitting RH side to LH or with filing known spot on LH side. The problem I'm having is getting the slide to go back on after installation. It stops dead cold over the safety and appears to be hitting the RH side flat of safety just above where it comes into the frame. Looking at the factory installed version it appears this flat area has been filed down more. On the right track? But, the right side safety has two flat surfaces on it. One that is parallel to the slide/frame rails when the safety is in the FIRE position and the other forward of that spot and is angled down/forward when the safety is in the FIRE position. I cannot see where/why taking a little more metal off that flat spot that is parallel to the slide/rails when in the FIRE position would hurt anything. In fact, you might be able to remove the slide, put the safety in the FIRE position and feel a slight "bump" if that flat spot sticks up any at all. If it does stick up that might be what the slide is catching on. While the disclamers always read about having a qualified gunsmith install parts it is very satisfying to work on your own and figure out problems and fix them. Thank you, will definitely give it shot. Good to know it can't hurt. Evidently there are tolerance differences from pistol to pistol as I've not seen any info that this can be a problem area. As these come in a set, just did not want to ruin one side. Finally found a picture (not the best, but it should do) of mine. Just above my thumbnail you can see a short shiny spot on the rail on the right side of the frame. Just in front of that is a short dark spot. That short dark spot is the right side safety shaft and one of the little flats on it. 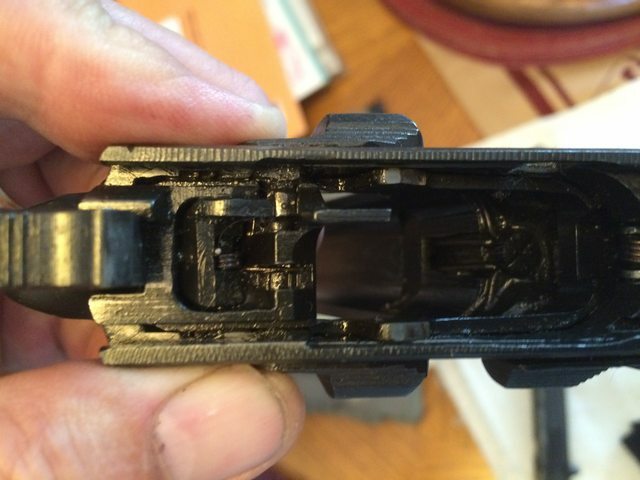 The one that is parallel to the frame rail, but slightly below the frame rail, so no contact is made with the slide. May be why that area isn't shiny - because it doesn't make contact with the slide as ths slide moves. I shouldn't take but a little polishing to stop that from contacting the slide - if that is where contact is being made. That's exactly where the slide is making contact as the area is slightly above the rail. Initially I was thinking the left side where it makes contact with the sear arm as that's the only other recommended filing area. However that did not make sense as it's going under the sear arm when rotated. Thanks again. Will relieve metal there this weekend and should solve the problem. Hopefully this will help others also.